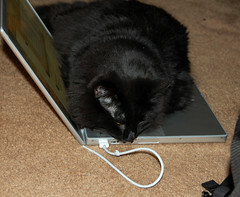 Bear really loves to crash out on the MacBook Pro. Sadly, he also thinks the power cord is a playtoy. Oh, yeah, and I have a new theme. I got tired of Mandigo losing its settings all the time. One of my cats likes that position as well, in her case it is the mouse not the power cord. Next Next post: Happy Daylight Savings!